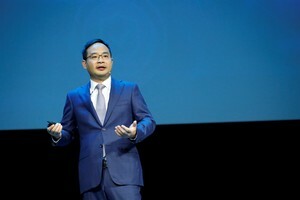 SHANGHAI, CHINA--(Marketwired - Sep 6, 2017) - Today, on the first day of HUAWEI CONNECT 2017, Zheng Yelai, President of Huawei's Cloud BU and President of the IT product line, updated attendees on the current progress of Huawei cloud business, and also unveiled Huawei's innovative Enterprise Intelligence (EI) solution for the enterprise market. Enterprises have been carrying out digital transformation using cloud computing technology, and have now entered the value creation stage. Huawei believes that a cloud will prosper only when it helps customers create value on an ongoing basis. Artificial Intelligence (AI) is now widely recognized as a gold-mining engine, but AI research and application projects are more closely linked to single point AI techniques. These simple applications cannot satisfy the needs of many enterprises. In particular, the supply chain, manufacturing, and management systems of large- and medium-sized enterprises require more complex AI applications. "The best cloud must be able to deliver the services that customers need, and AI needs to create more value for enterprises. To make this happen, we have to integrate single-point techniques and apply them, together, in sophisticated enterprise scenarios," Zheng Yelai said. "We're positioning Huawei Cloud as an enabler of the intelligent world. It provides AI, IoT, computing, and storage capabilities that provide enterprises with more innovative, intelligent cloud services. Through Huawei Cloud, we are essentially exposing our most formative achievements and practices in R&D -- which we've built up over many years -- to governments, enterprises, partners, and developers." At the customs clearance stage, Huawei uses EI for compliance analysis. Huawei's EI technology is able to identify abnormal data based on historical data and exchange rate changes, and issue warnings in the event of any anomalies. This enables enterprises to complete customs clearance on the first attempt and thus reduces the risks of overstocking. As for warehousing, EI adds intelligence to the process. For example, EI helps to design the best solutions to place and categorize goods and optimize paths of choosing goods and their storage spaces. This has led to a 10% improvement in Huawei's warehousing efficiency. Yang Xiaoling, CDO of China Pacific Insurance Company (CPIC), also spoke on the first day of the event. He shared CPIC's experience using OCR technology to handle health insurance claims. Customers are able to take photos of their medical documents and upload the images to CPIC's system, which will automatically read the documents and create structured claims documents to support the processing of the claim. An estimate suggests that the use of OCR technology will help CPIC cut labor costs by more than 50%. CPIC looks forward to working more closely with Huawei on image recognition and deep learning to develop the solutions that the insurance industry needs. During the day, Li Qiang, Division Chief from the Shenzhen Traffic Police Bureau, also shared Shenzhen's leading experience in intelligent urban transportation. By using Huawei's AI platform, the Bureau is able to pre-filter traffic violations images, enabling a 10-fold increase in the image screening efficiency. The intelligent traffic solution jointly developed by Huawei and the Shenzhen Traffic Police Bureau was honored with the '2017 Innovative Road Traffic Offering' award from the Chinese Road Traffic Safety Association. Thierry Bonhomme, CEO of Orange Business Services, a partner for Huawei's public clouds, also updated attendees on Orange's latest progress in the cloud service area. In other news, the European Organization for Nuclear Research (CERN) has been running their workloads on the public cloud that was jointly developed by Huawei and Deutsche Telekom. Relying on thousands of Huawei's high-performance computing nodes, CERN has lowered the overall maintenance costs of Large Hadron Collider (LHC) experiments by approximately 67% and shortened the online cycle from 90 to 15 days. Zheng further elaborated on some of the core concepts that differentiate Huawei Cloud, including reliability and openness. He stated that Huawei is committed to becoming a neutral service provider. Since the Cloud BU's formation in March 2017, it has seen a 238% increase in Huawei's cloud user base, and has released 40 new cloud services, including the data warehouse service, advanced DDoS service, and CDN service. As of now, Huawei has released a total number of 85 cloud services. In the meantime, over 4,500 new features have been added to Huawei Cloud. For more information about Huawei Cloud, please visit www.huaweicloud.com. Huawei is a leading global information and communications technology (ICT) solutions provider. Our aim is to enrich life and improve efficiency through a better connected world, acting as a responsible corporate citizen, innovative enabler for the information society, and collaborative contributor to the industry. Driven by customer-centric innovation and open partnerships, Huawei has established an end-to-end ICT solutions portfolio that gives customers competitive advantages in telecom and enterprise networks, devices and cloud computing. Huawei's 180,000 employees worldwide are committed to creating maximum value for telecom operators, enterprises and consumers. Our innovative ICT solutions, products and services are used in more than 170 countries and regions, serving over one-third of the world's population. Founded in 1987, Huawei is a private company fully owned by its employees. Zheng Yelai, President of Huawei's Cloud BU and President of the IT product line unveiled Huawei's innovative Enterprise Intelligence (EI) solution for the enterprise market.